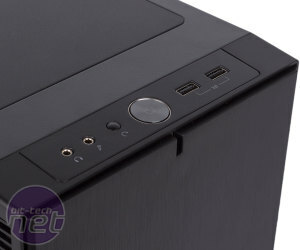 Today sees Fractal Design launch two new cases: the Define C and the Define Mini C. It's the latter we're looking at today. 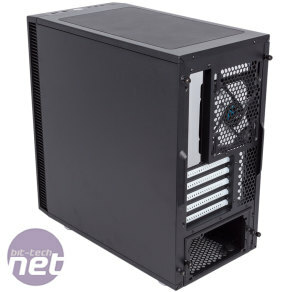 It serves as a replacement for the ageing Define Mini and purports to do the same thing: offer a low-noise environment for micro-ATX builds. The case will be available in two SKUs, specifically one with a window and one without. 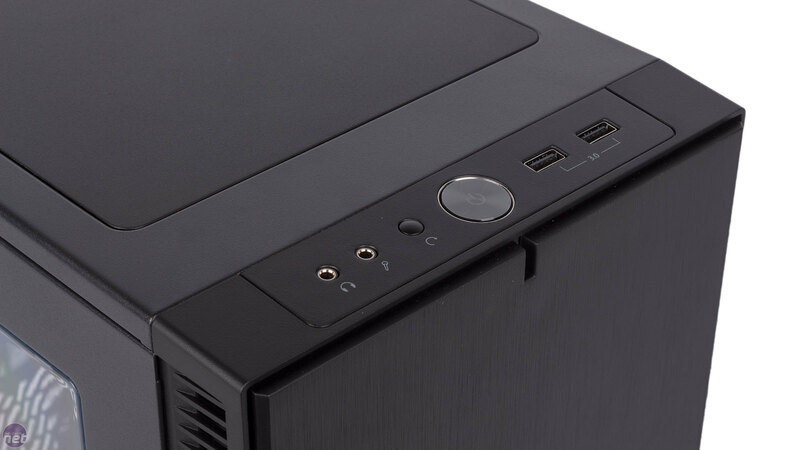 While micro-ATX does save you some space versus ATX, it's not a whole lot, and with its tower design the Define Mini C isn't far off the dimensions of your average mid-tower. An external examination reveals an all-black, minimalist design that is, by now, very familiar, although it is one that Fractal can at least claim credit for popularising with the original Define cases. 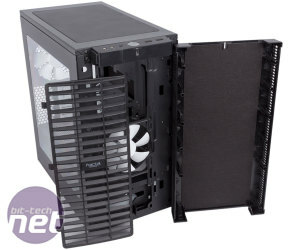 Pushing on various parts of the case reveals that it's a nice, sturdy unit overall. There's no optical drive support so the front is completely solid and has a brushed metal finish despite being actually made from plastic. Air is still able to enter the front via the ventilation strip down both sides, and this is handy since there's a 120mm fan installed in this area out of the box. 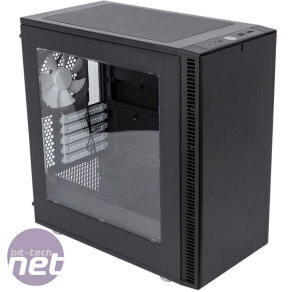 This is complemented by a rear 120mm fan, so airflow through the case should be fairly balanced as well as mostly unrestricted on the inside thanks to an open, drive-bay free design. 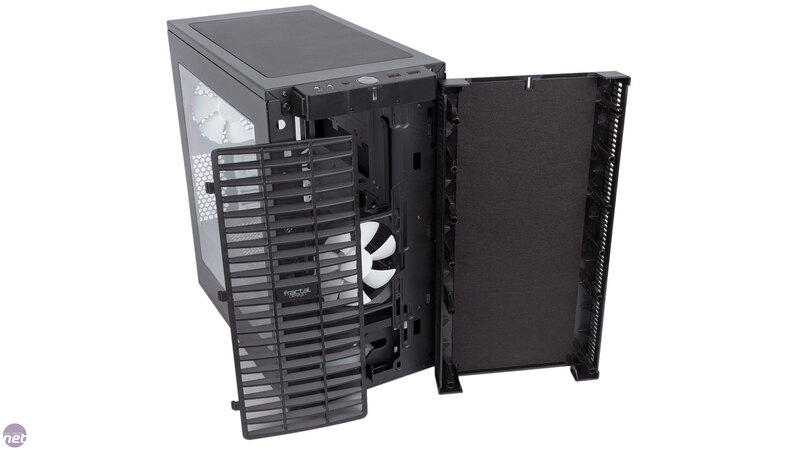 The case actually supports up to six fans in total, although unfortunately there's no fan control – this irks us more in cases like this that are designed for low noise. The two fans supplied are Fractal's own Dynamic X2 GP-12 models, which usually retail for £9 apiece. 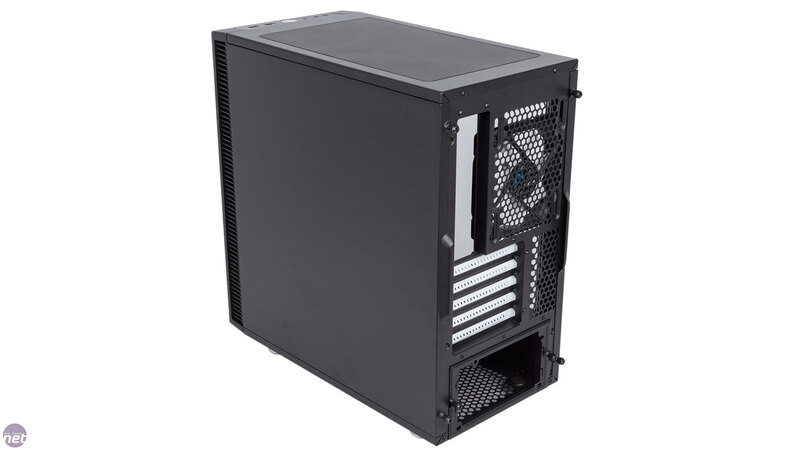 The I/O panel is located on the top, which should be suitable regardless of whether the case is placed next to you or below you since it's not too tall. The selection of ports is totally standard, although the blacked out USB 3.0 ports are a nice touch in keeping with the overall aesthetic. The window in this edition is large and completely transparent. 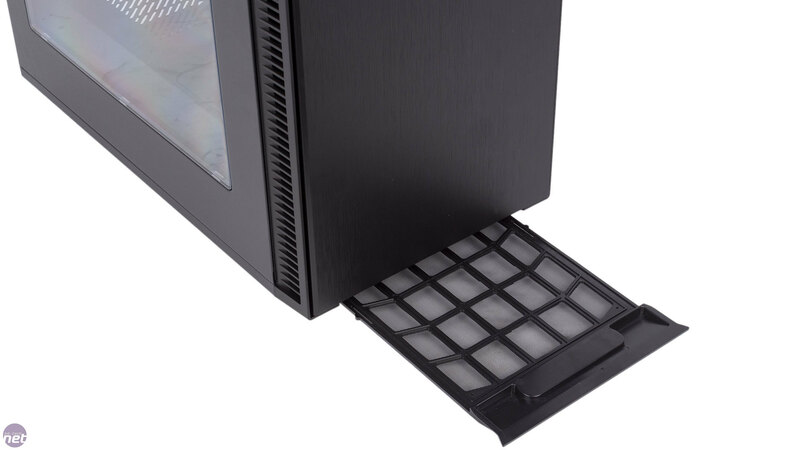 We've seen a lot of tempered glass cases recently so it's hard to be too wowed by the build quality as the acrylic does lessen the panel's rigidity overall – it also won't be as effective at dulling noise. Still, the window is built in neatly and flush with the steel. The Define Mini C stands on feet that are properly rubberised on the bottom for maximum grip and noise dampening. 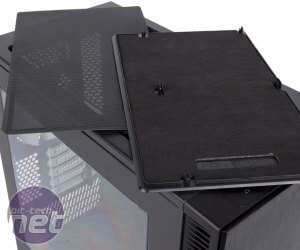 There's also a full-length dust filter along the bottom guarding the fan mount here and the PSU and, conveniently, this is accessed from the front, although the clearance from the feet is just a little too low so you'll have to lift the case slightly to get a grip on it. Nonetheless, after that it slides out and back into place easily. With the lower filter out you can get a grip on the front panel and pull that off too. 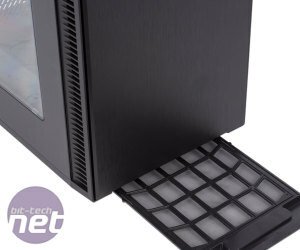 Thankfully, the I/O panel is fixed to the case separately so the front comes away cleanly and gives you access to the full-height dust filter here – we can also see that it's backed by noise-dampening material. 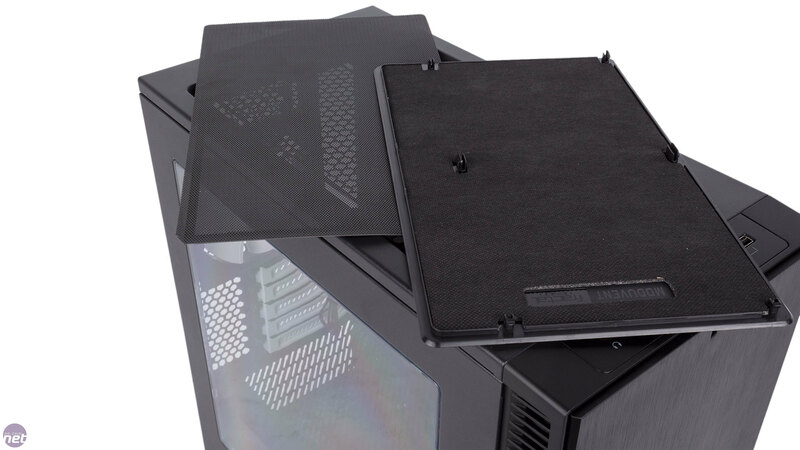 The plastic ModuVent blanking plate on the roof can be removed (although only from the inside, annoyingly) and Fractal has seen sense by giving users a replacement dust magnetic dust filter for those that do so – something that is often overlooked. 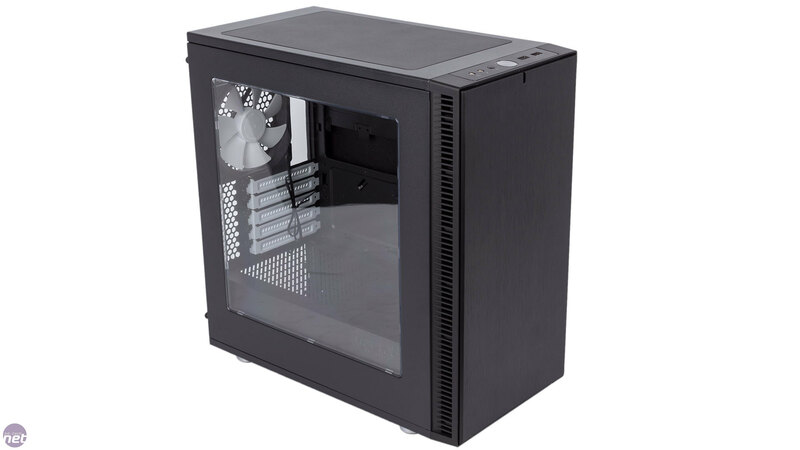 Whatever setup you go with, removing, cleaning and replacing the filters on this case will not be a lengthy or fussy process.